I have been struggling with sleep related issues for the last few weeks. At the suggestion of a good friend I tried a product called Melatonin that is a natural chemical designed to help you stay asleep. One of the side effects is you can get some pretty funky dreams. After my first night using the product I woke up from the most vivid dream I had had since being a child. In this dream a gun was presented to me that was functional and attractive, defensive yet beautiful and exactly the gun I needed to have. There was one issue, no such gun existed, so I wrote down the features that stuck out to me and started looking into who could make my dream come true. 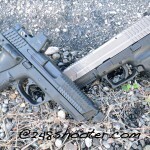 Enter John and Jeff at Innovative GunFighter Solutions. 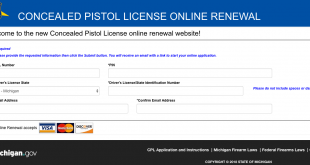 These guys are a Milford Michigan based company that has created a patent pending design for one-handed manipulation for Glock and M&P style pistols. Several companies do serrations across the side and top, but that usually only entail a simple design much like the original factory side serrations. After learning what IGFS was doing with these defensive serrations we knew they were the right guys for the job. After talking to John he understood my vision perfectly and became as excited as I was about the prospect these modifications would offer. Sights that work day and night. While the last one was really the least of our concerns it would be hard to spend the amount of money needed to achieve the other 7 items and then have an ugly gun. Here is how we set out to achieve our goals and match the “Dream gun”. Picking the right base gun was by far the most difficult part. We settled on a Glock Gen 3 Model 19. 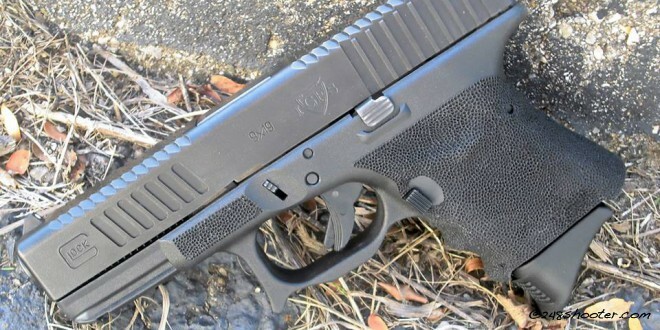 In order to achieve items 1 and 2 on our list of requirements the decision to cut the gun down to a G26 length grip was made. This single decision has been the most argued point of the entire build. We get the G26 fans saying things like. Why would you not just use a G26 what is the point of ruining a G19? Well for 1 we didn’t ruin a G19 we made what turned out to be one of the best guns I have ever owned. 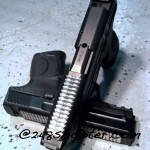 2nd the G26 does not have a integrated rail so would not meet our requirements. The gun needed to be able to support a light for low light, no light operation. The G19 fans say things like. Why would you chop down the G19 it is small enough and already a compact gun? What is the point of going smaller? To answer this let me state that we have repeatedly said here that everyone has a different body shape and concealment needs. As such I personally do not conceal a G19 well when not wearing a vest, jacket or sweater. Though I do get to wear these items much of the year I prefer the ability in summer to not always have to carry my Sig Sauer P938 so I want a gun the size of the G26. Not to mention that due to the available pinky and grip extenders it is easy enough to load a G19 or G17 mag into a G26 when concealment is not an issue. So in essence a chopped G19 can be the same as a G19 with the advantage of being smaller when you want it. The last group is the super cowboys. Hey man if you’re going to cut down a G19 why not be a real man and do it with a G17? This one is a matter of choice. The G17 is actually a prime candidate for this and frankly after doing the G19 this way I would consider another build with a G17. You get a longer slide for increased accuracy and velocity. 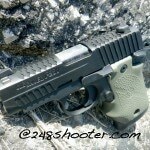 The only downside is the slide is maybe to long for appendix carry and creates a slightly longer draw. For me the G19 was a gun I had already and was the perfect middle ground. 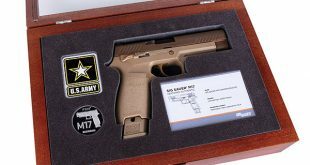 If you have a G17 then you might want to consider that as your best option. 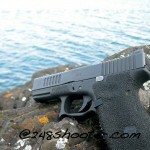 The chopped down G19 is able to accept G26 magazines with or without pinky extensions. 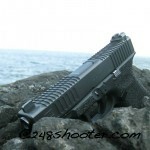 It also accepts the larger G19 or G17 magazines with or without an adapter. Right now I have 3 magazines I run through this gun. G26 without pinky extension as my deep concealment primary magazine. G26 with Pearce +1 pinky extension when wearing slightly larger clothing. Since we picked the G19 we had the built in light rail and were good to go for item 3. Item 4 took a bit of trial and error as well as feedback from John. Glock makes some good sights. IMHO they are not the best on the market and I find the rear sight to be very distracting with the gigantic u shaped white border. 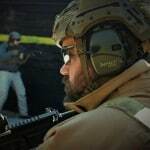 My first thought was going with a Trijicon fiber optic front. These work great in daytime and low light situations. The drawback is they need at least some light to function. With having the rail on the gun the likely hood of having a light was high but I did not want to count on that. Next we considered and discussed night sights, which work great at night but can leave something to be desired during the day. John then suggested the AmeriGlo I-Dot Pro series. 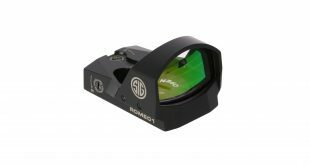 This combines a photoluminescence limegreen outline with a green tritium front sight for quick acquisition, with a dot over dot rear tritium sight. 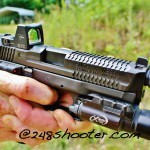 The end result is a fast to acquire sight picture day or night. If you have not checked these sights out we encourage you to look at them for yourself. The reason we went to IGFS in the first place was requirement number 5. Innovative Gun Fighter Solutions is a pioneer in the serration customization marketplace with their patent pending designs that are specific to each make and model. John and Jeff have partnered to create a patented pending process that actually serrates the radius of the slide. This is a huge departure from the industry standards. Look below to see the difference. These radius serrations which we have been incorporated into the overall design were developed to give the user the ability to perform the same one handed manipulations without having to roll the gun 180 degrees to run the slide from the top only, now they can use multiple angles of the slide. There is no guarantee that in any given situation you will be able to get the gun into a position in order to manipulate the slide from the top only, due to injury, occupation, hands on contact, ect. It gives you a viable added benefit when fractions of a second count. The M&P radius serrations show a drastic improvement versus the top serrations alone. The M&P has a shorter flat top area to apply top serrations too, putting it at a disadvantage over the Glock. By adding our Radius Serrations onto it, they are able to cover MORE than double the amount of surface area than the tops alone. This was not a factor in our build as we picked a Glock but shows the level of thought and effort that has been put into this project by IGFS. The end result to the gun is a very aggressive looking design that is highly functional. We have racked this gun one handed off more surfaces then I can count. Due to the professional coating that is done to the gun after CNC process we found that even racking off wood tables and trees no damage was done to the finish. I would be careful racking off another metal surface or concrete but if the time comes that you need to rack a slide one handed the finish on your gun is the least of your worries. Item 6 was something I learned the importance of during several training courses. You will not be able to control the weather when you are engaged in a defensive encounter. Further blood in my personal opinion is one of the slipperiest liquids around (until it starts to dry) as such being able to manipulate and hold your gun when bleeding or in the rain is vital. Considering this gun was chopped to a G26 size grip texture was a larger issue due to the loss of a pinky hold in its most compact state. I have used grip tape and A-Grip in the past on some of my guns. They work fine but will wear and can leave a sticky residue if they pull back. After the job that Lightfighter Innovations did for me on my PMags in the past I knew the answer to this problem was stippling. John was already doing the other work so we opted to let IGFS do the stipple work as well, they did not let us down. John intricately and methodically stippled the handle of the gun creating an easy to hold surface. He also reduced the overly exaggerated finger grooves making the gun easier to hold on to. Further he undercut the trigger guard to get a higher grip allowing more purchase area for my hand. Lastly the area around the mag release was scalloped out so that it created the feel of an extended mag release without the additional protruding plastic. The combination of the slightly thinner grip with aggressive stippling made this the most comfortable Glock I have ever held. Item 7 was a personal touch will not fit for everyone. Like many who are concerned about safety I practice drawing with an unloaded firearm. When doing so my goal is to get my finger forward of the trigger guard on the frame of the pistol every time I draw. On my OWB holsters I usually scratch or stipple that point on the holster so I can find the spot during draw. John created an index point of stippled material on the frame allowing me to always know my finger is in the right spot without having to look. In addition to this I shoot my pistol with a slightly modified stance. There have been several schools of thought on your support hand placement. You will notice on the Glock it has a grooved and scalloped trigger guard, which was, where police had been trained to place the finger of the support hand. This practice often caused a pulling to the lower left during firing and has gone out of fashion. One of the more common current school of thought is to have the support hand completely wrap around your main hand with thumbs pointing down the barrel. This works just fine and is the most common current technique. I however move my support hand up and forward under the trigger guard to offer more stability forward on the gun. This causes my first off hand finger to rest at the bottom forward of the trigger and the second finger would then support the back of the trigger guard. As such John has created a second undercut in the trigger to support this forward finger. Take from it what you will but I prefer this method and think you will see more and more shooters moving to this method in the coming years. Undercut serration’s for modified stance. As for 8, like beauty, can be found in the eye of the beholder. 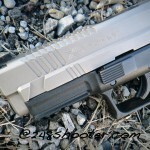 I find function to be beautiful and this pistol is functional to its core. None of the features or steps done was done for an ascetic’s reasons. 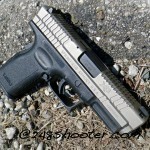 However when you step back and look at this gun you cannot help but think damn that just looks awesome. At the range the IGFS G26L as we have taken to calling it, performed admirably. There were no real changes to the gun that should have caused the firearm to be less accurate so no surprises there. The slide is slightly lighter then it was before but I noticed no difference in recoil or how the pistol handled. We fired the IGFS G26L using 3 sets of magazines. The standard no extension G26 magazine was the hardest to be accurate with, however it shot very well and was able to be controlled nicely thanks to the added grip surface of the undercut trigger and stippled grip. The G26 with a +1 pinky extension was the most comfortable to me, since that is how I have shot my G27 for years. This will most likely be my primary magazine moving into the fall. The G19 magazine with grip adapter was similar to the G26 +1 pinky extension. It did give more area in the rear of the firearm to wrap the palm around but did not make any real difference in handling. The real advantage her is the extra ammunition. This will be what I carry in my pocket inside my SnagMag holder. 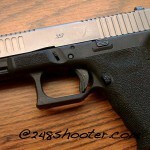 The gun fits in any holster designed for the G19, or a G26 if it has an open bottom. 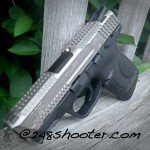 I am currently using my S-Con Max from Sawyer Concealment in Jackson Michigan creating my completely Michigan based Glock build. The Inforce APL 200 lumen is my current go to light but we may be changing that up based on some lights we have in the mail to review. 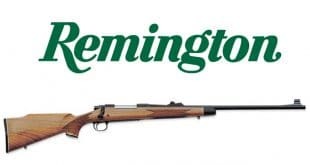 We will be expanding this review in the coming weeks with a photography session and more range reviews as well as feedback from other team members at 248Shooter. Please bookmark this article and check back with us. Check out this Gallery of work they have done for other clients. Contact IGFS on Facebook or Email them: Info@IGFS.co to learn more.